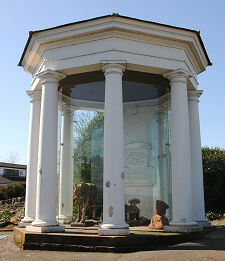 Dumfries Museum and Camera Obscura stands on the highest point in Maxwelltown, the once separate settlement that looks east across the River Nith to Dumfries. Parking in the area is a little tight, and the museum is best reached following good signposts on foot having parked either in Dumfries itself, or near the Robert Burns Centre or Old Bridge House Museum on the west bank of the river. Disabled parking is available at the museum. Dumfries Museum was first built on this site in 1862, though what you see externally today owes much more to a large extension built in 1981. It is attached to the tower of a windmill built in 1798. Facing competition from nearby watermills on the River Nith the windmill was never a commercial success, and in 1836 it was taken over by Walter Newall and converted into an observatory and camera obscura intended to allow observations to be taken of the night sky in general, and Halley's Comet in particular. 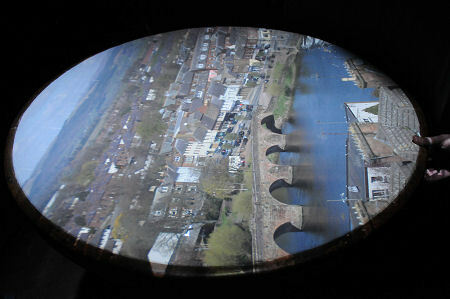 Perhaps because it is a little removed from the centre of Dumfries itself and from the River Nith, it is all too easy to overlook Dumfries Museum and Camera Obscura. To do so is a shame, because what you find is a truly excellent museum covering all aspects of Dumfries and Galloway, plus the added bonus of a working camera obscura. Entrance to the museum is free, while a small charge is made for admission to the camera obscura. This operates during the summer half of the year, though not when it is raining in order to protect the mechanism. The grounds and gardens of the museum are themselves home to a number of interesting exhibits, including Covenanters' gravestones and a Russian cannon captured during the Crimean War. More striking, perhaps, is the Sinclair Memorial. This was erected in 1841 in memory of John Sinclair, an assistant naval surgeon who died (in a "mournful accident") in Hampshire on 26 October 1840. The day before his death he had won life size statues of Old Mortality and his pony in a lottery, and after his death they were presented to the observatory and placed in the building that still houses them today. The museum itself offers a large oblong gallery at ground level, while at the upper level is a balcony running around the lower gallery plus a series of further galleries. Meanwhile, the five floors of the windmill provide a surprisingly large series of vertically stacked galleries. The museum has a number of what might be called star exhibits. Two of these are obvious as soon as you walk in through the main entrance and approach the reception desk: bicycles made by Kirkpatrick Macmillan, the local man credited by many as being the inventor of the rear-wheel driven bicycle in 1839. The main ground floor gallery is a treasure trove of Dumfries and Galloway's archaeology, geology and natural history. Lighting and presentation are excellent and there are some wonderful things here: though not always the most obvious. We were especially taken by a recreation of a kist burial, a form of burial in which a folded body is placed in a stone lined container in the ground. It is common to see the remains of kists on archaeological sites, but until we saw this exhibit it was very difficult to visualise how it actually worked in practice. 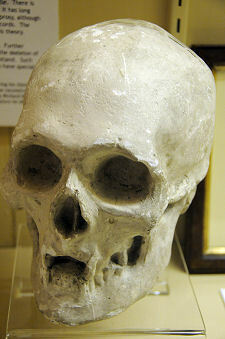 This gallery is also home to a cast of the skull of Robert the Bruce, made from the original unearthed in Dunfermline Abbey in 1818, plus other bone fragments believed to belong to Robert the Bruce. The balcony around the upper gallery is home to the museum's collections of textiles, and to a particularly striking collection of maps of the area produced at different times. The main galleries at the upper level are given over to local history, and include a spectacular display of the work of local silversmiths. The great thing about a museum like this is that everyone will have their own favourite subjects and exhibits. For us the real star of the museum itself was the gallery on the lowest floor of the windmill. This is very easy to overlook as it is reached by a set of steps down from the gallery above, and is home to a truly magnificent collection of carved stones. These range from Roman altar stones and carved Roman heads through Pictish symbol stones and early Christian stones carrying various forms of carved crosses. The stones are nicely displayed and the information available sets them beautifully in context. 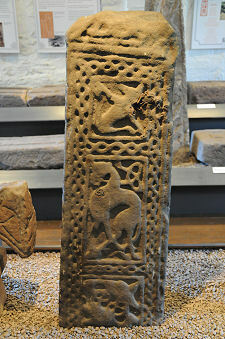 You will find collections of Pictish and early Christian stones in many parts of Scotland: the Roman collection in the museum, though in some ways less individually spectacular than the other stones on view, is truly outstanding. The upper levels of the windmill are reached by a spiral staircase that wraps, slightly vertiginously, around a ship's mast that is not quite straight and true. 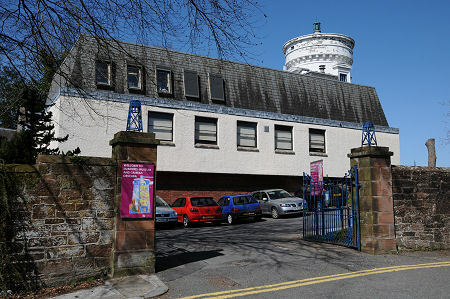 The main floor is home to a series of exhibits entitled "life on the land" about farming in Dumfries and Galloway, and to exhibits looking at the production of butter and cheese from milk. The next floor is given over to displays of local wood and metal crafts. 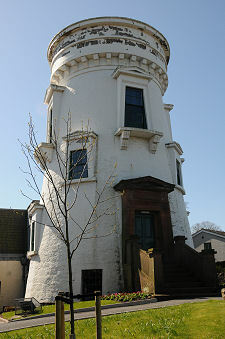 The penultimate level of the windmill tells the story of the creation of the observatory and the camera obscura by Walter Newall and the Dumfries and Maxwelltown Astronomical Society. Newall enlarged the upper floor windows and built platforms to allow the positioning of telescopes that gave views of the night sky in any direction. This was a time before light pollution was an issue. He also built what is arguably the museum's crowning glory, the camera obscura. Demonstrations are given by members of the museum's staff, and visitors continue up the spiral staircase of the windmill to an upper level lit only be artificial light and by what enters through a circular hole in the centre of the ceiling. 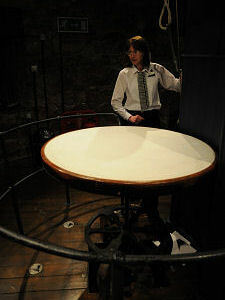 Within the chamber is a circular white table. With the light out, the camera obscura is operated by pulling on ropes dangling into the chamber which rotate the view and zoom the image. Because the windmill stands on the highest local point, the view is superb in every direction, though especially good of the bridges over the River Nith and of Dumfries itself. Focus is achieved by raising or lowering the table. In an age in which we all view moving colour images of reality on a daily basis it is easy to become a little "so what" about the idea of a purely mechanical contrivance which uses a lens and mirror to project an image of the surrounding area down onto a circular table. The truth is that even to modern eyes the effect this creates is startling and slightly magical, and it is hard to imagine just how remarkable this must have looked to its first visitors, in an age before any form of photography (still less TV) had been invented. Rotchell Road, Dumfries, DG2 7SW.